Reprint of LEC #86, 8th Series, V. 4 in 1937. 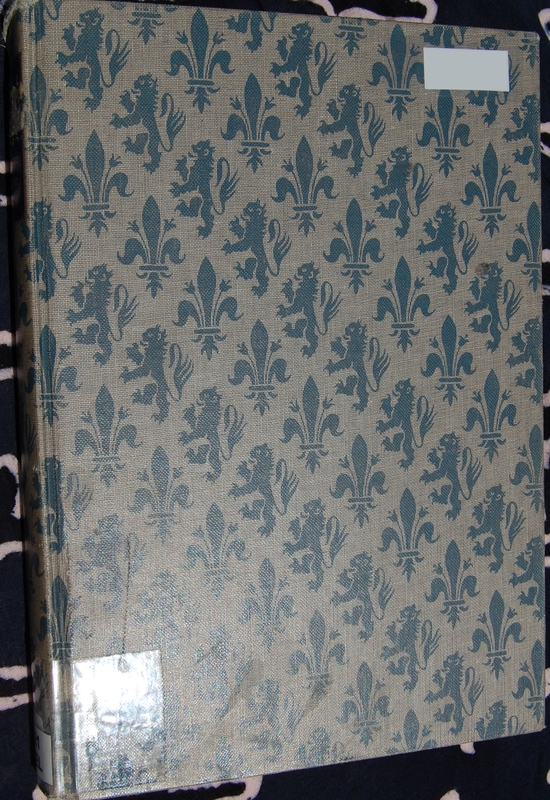 …the Life of Benvenuto Cellini was first issued in July, 1949. From my research, this is apparently the only time it was issued, although I remember having this book in the late 1960s when I was a member of the Heritage Club, but checking Bussacco’s Checklist, there is no record of it having been issued after Series N (June, 1949–May, 1950). 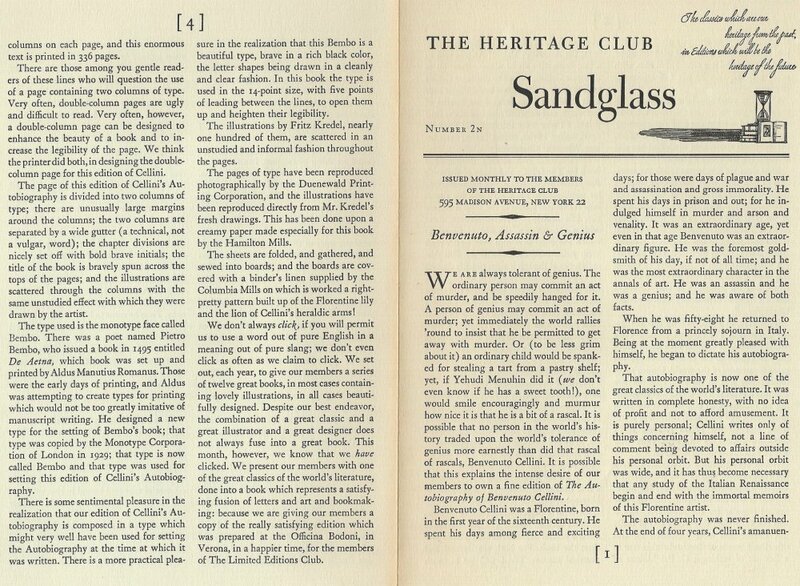 Unhappily, I sold that edition in the 1970s so I don’t have the Sandglass, but I do have the LEC edition and Monthly Letter and can add a few interesting facts. Cellini’s autobiography was among the most requested books in the polls conducted of the LEC subscribers in the early years of the Club. Symond’s translation was very popular, but I imagine what particularly stimulated interest was the very successful 1934 motion picture, “The Affairs of Cellini,” starring Frederic March (an early and lifelong LEC subscriber, incidentally, and friend of Macy’s), which was not really based on the Life but on the play “The Firebrand,” by Edwin Mayer (who later adapted it as a musical with music by Kurt Weill and lyrics by Ira Gershwin). When it was decided to issue the autobiography, a contest was held by the LEC for book illustrators (the Life was one of 30 titles submitted to over 400 illustrators), and the title most chosen for illustration by these worthies was Cellini’s book. Cyril Bouda, C. Pal Molnar, and Valenti Angelo were among the artists who sent in sample art for Cellini, but the judges felt Kredel’s samples captured best Cellini’s nervous, and yet meticulous style. 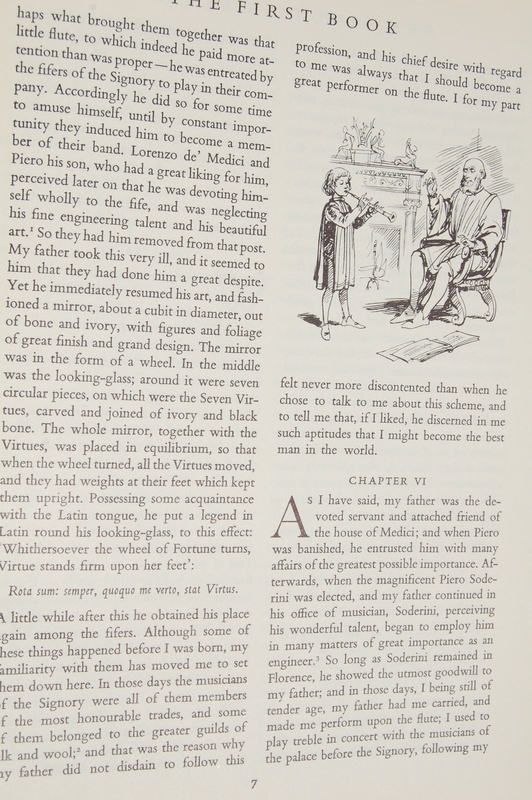 The Officina Bodoni was chosen “for sentimental and practical reasons,” but apparently Signor Mardersteig changed his mind about the design of the book, for though the original prospectus for the LEC series described a 2-volume Life, Mardersteig decided that one large book with double printed columns could hold all the text in a single volume. One senses in the description of this in the Monthly Letter that Macy himself was not a fan of double columns, but nevertheless he praises the way it is laid out. The typeface is Monotype Bembo, a face designed by the great Aldus Manutius, a near contemporary of Cellini, and printed on a 100% linen rag paper made by Cartiere di Maslianica in Milano. The binding was especially woven for the book using a pattern made up of the Florentine lily, and the rampant lion from Cellini’s coat-of-arms. The binding is identical to the Heritage binding, so either the Officina had a lot left over, or it was recreated for the Heritage edition after the war (the war I suspect is the reason the book itself was issued as a Heritage book so long after the LEC version). This was Fritz Kredel’s third commission for the Limited Editions Club. I see that I have neglected putting up his full commission list in the past, but I’ll rectify that on an older post. For now, you can see his other work I’ve spotlighted here. Benvenuto Cellini was himself a busy fellow, leading the way as one of the more important artists in the Mannerism school, and was busy in other fields like music, goldsmithing, and writing (this particular book in fact!). This is his sole publication in the LEC/HP bibliography. 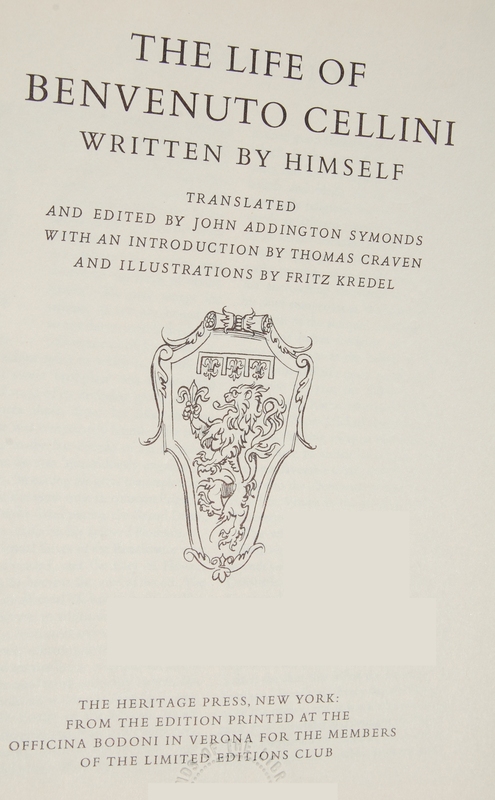 Title Page – John Addington Symonds translated Cellini’s words into English, and also served as an editor for this edition. Thomas Craven introduces the book. Kredel’s work is not full page size, but the detail is pretty incredible regardless! 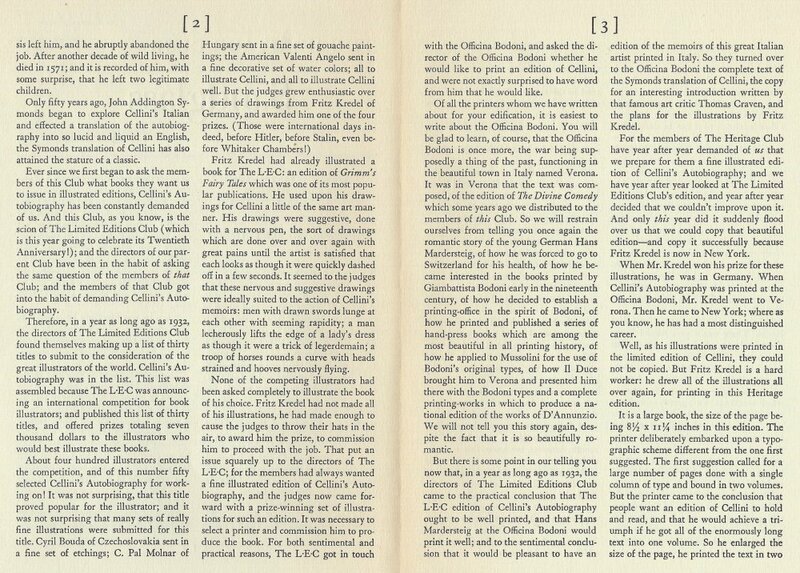 An interesting followup to the LEC edition was a notice in the Monthly Letter for The Ballad of Reading Gaol–the following month. The Directors of the LEC were compiling a list of the top 50 bookbinders in the world, and were going to send those 50 an offer to bind one of the 50 copies of the unbound sheets for The Life of Benvenuto Cellini (the LEC apparently always made extra sets of pages for each edition). Those that accepted would be paid and all the bound books were to be sent around the world as an exhibition of the state of the bookbinder’s art in the late 1930s. Whatever came of this fascinating plan is a mystery–at least to me–and one would love to have known who was on the list, who accepted if the plan was carried through, and what happened to those books? What did happen to that idea, I wonder? Big thanks to Django6924 for the additional comments! 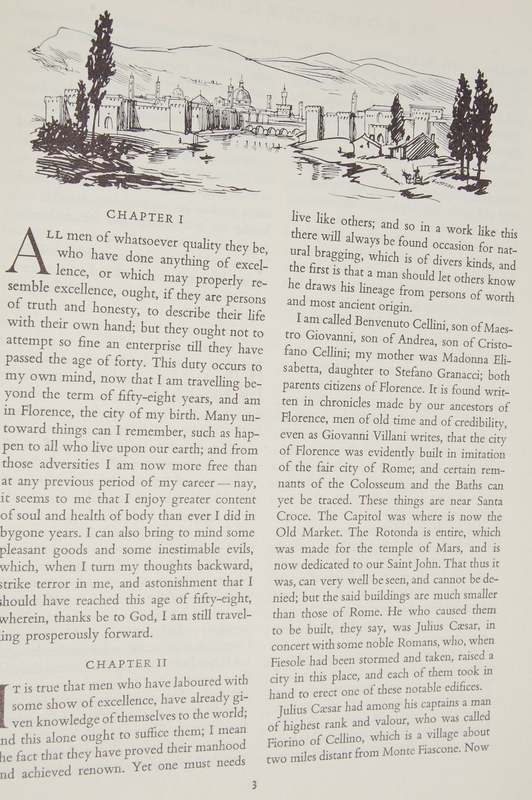 You are currently reading Heritage Press: The Life of Benvenuto Cellini (unstated, 1949) at The George Macy Imagery.